Reconsidering a history of the pro-life movement. On Sunday, May 31, a man walked into a Wichita Lutheran church and shot Dr. George Tiller to death in front of his wife. The man accused, Scott Roeder, had been following Dr. Tiller, attempting to vandalize his clinic and appearing at Tiller’s misdemeanor trial earlier in the year. 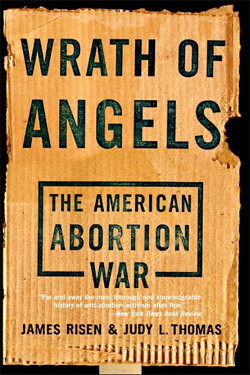 Wrath of Angels: The American Aborition War by Jim Risen and Judy Thomas. 416 pages. Basic Books. George Tiller had long been a favorite target of extremist pro-life groups such as Operation Rescue, as he was one of the only doctors in the United States who would perform late-term abortions. Most of his clients were women whose fetuses had severe birth defects, but he was labeled one of the worst offenders of the war on the unborn by groups including Operation Rescue and the Army of God.